Having contributed to the sales of billions of dollars in new products and services for technology companies, Mark Hart, Founder of OpLaunch, has a passion for optimizing product launch. Since 1983, Mark has contributed to the development and commercialization of technology products (such as measurement systems for scientists and engineers, software, computers, and training applications) that have become global leaders in their categories. From 2004-2011, Mark was the Launch Editor for PDMA's Visions Magazine. In 2002, Mark obtained New Product Development Profession (NPDP) certification as defined by the Product and Development and Management Association (PDMA). This certification program formally recognizes knowledge, education, and experience in new product or service development. In 2001, Mark created OpLaunch to assist technology companies with their product launch programs. 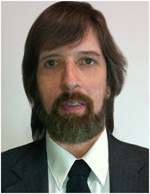 Mark has combined best practices from Hewlett-Packard (such as world-class product development, product life cycle management (which is similar to Stage Gate), total quality management, ISO 9000 practices, and localization) with the agile practices of other companies and leading experts to create a company that specializes in optimized launch for technology products. In 1999 and 2000, Mark worked as an independent consultant at IntroDesigns Incorporated, a company he co-founded. IntroDesigns was created to help technology companies launch hardware, software, and information products. IntroDesigns was located in the Silicon Valley of California. IntroDesigns assisted large companies (such as Hewlett-Packard and Agilent Technologies) and small companies successfully launch high-tech products. From 1983-1999, Mark produced multimedia materials to enhance productivity and increase customer satisfaction at Hewlett-Packard Company products. The work that he did for HP products helped them grow to dominant positions in their specific areas while increasing customer satisfaction, reducing training budgets, and reducing warranty costs. As a multimedia developer and producer, Mark was passionate about creating usable training and information products. He conducted usability tests and designed comparative performance tests. He has studied interface design and instructional design. Mark began his HP career as a technical support engineer for scientific measurement equipment. For ten years he crafted the worldwide support for UV-Visible Spectrophotometers, Fourier Transform Infrared Spectrometers and Mass Spectrometers. He created and delivered training classes, wrote technical documentation, and supported hardware and software systems. Mark had constant interaction with marketing, hardware and software research, and development and manufacturing organizations. He has conducted training for worldwide sales and service personnel. In May 2009, a video that Mark produced, the Elliott Virtual Lab Tour video won a Bronze award in the C13 Business Equipment and Services category of the Telly Awards. His 1998 Society of Technical Communications award winning Reference Collection is a three CD-ROM set that features multiple hours of video instruction for hardware maintenance, software operation and application specific training. 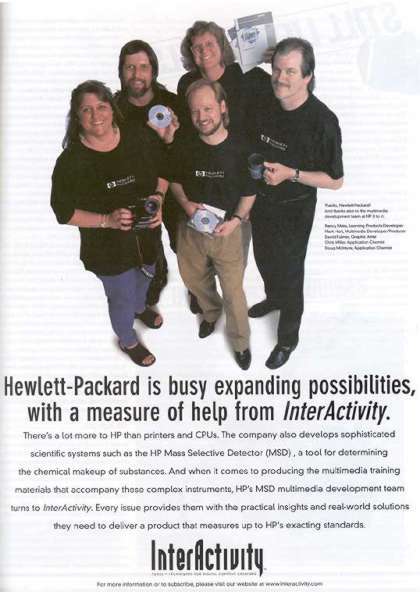 In late 1998, Mark (second from left) and the HP team that produced the Reference Collection were featured in promotional materials for the Miller Freeman publication Interactivity. His Mass Spectrometer Fundamentals project (which includes CBT, videotapes and printed manuals) was favorably reviewed in the Journal of Mass Spectroscopy (June 1995, volume 6, number 6, pages 536-537). In addition, it has been OEM'd and is being distributed by an independent training provider. In 1993, Mark's work was featured in an Intel brochure and videotape, "Success Stories in Business Video" on the use of digital video. In 1989, Mark produced the first computer-based training to be delivered to HP's Analytical Products Group customers with their systems. This 500 screen CBT provided interactive training in software and hardware operation of the HP 5971A Mass Selective Detector. His online communication began in 1989 when he created and managed an online customer support section on CompuServe. Prior to joining Hewlett-Packard, Mark earned a Master of Science degree in Chemistry from the University of Arizona. He designed, built and operated airborne measurement equipment for a coalition of universities and NASA researchers. Mark earned his Bachelor of Science degree in Chemistry from Washington and Jefferson College. Mark has served the community as a science fair judge, business plan competition judge, school board member, volunteer music director, and emergency medical technician. OpLaunch is a new product development studio that enables individuals to shape their approach to new product development to improve their potential to win consistently.